Welcome to this week's edition of Frugal Friday! Last week's party had so many inpsirational posts, I had a really hard to limiting them to just a few to share in my Frugal Round-up. First up, Maple and Magnolia shared her fabulous writing desk and chair makeover. Primitive and Proper linked to her clever chalkboard armoire makeover....I love this idea! See a beautiful bathroom stencilling makeover at Isabella and Max Rooms. Pine Cone Prim shared a darling sleepout-porch-turned-bedroom makeover. 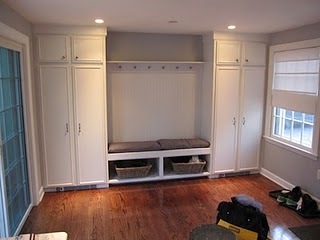 Love this mudroom makeover at Simple Beautiful Home. 2. Please link back to the Shabby Nest so that others can enjoy the frugal goodness. 3. Please leave comments for the authors of the posts you visit. Help our participants feel the love. I reserve the right to remove any links that are not in keeping with the spirit of Frugal Friday including but not limited to those that link to your own linky party, those that link to your business, or those that promote personal interests or businesses. Let's all play fair, mmmkay. Great features Wendy! I love Janell's stencil in the bathroom. :) Thank you for hosting another party! Such creative souls on here! I love that amoire with the chalkboard, it's beautiful!! Thanks for hosting this lovely party! thank you so much for featuring my armoire, wendy! and by the way, love the bangs! i have been contemplating something fresh for my hair this season, too... but i have no idea what! I'm loving the desk! what a great art piece. Thanks for sharing! Lots of great redos featured! Thanks for hosting this blog party! WOW! What great features!! Thanks for hosting! good gravy I can't believe all these great ideas....so much talent and inspiration out there...I love it! !